WASHINGTON — The head-in-the-sand mentality applies to the liberal mainstream media as they question why Americans are upset Obama was on vacation while international crises raged. Reuters’ latest piece , entitled “As Obama’s vacation ends, criticism does not,” reporters wondered how Obama could receive such negative attention  for a vacation in Martha’s Vineyard. At this same point last year, Reuters complained that Obama’s August vacations tend to be shortened due to crises . Obama returns to Washington on Sunday faced with having to repair some of the dings to his reputation after he came under fierce criticism for playing golf amid smoldering crises involving Islamic State militants, racial unrest in Missouri, a Chinese plane’s altercation with an American aircraft over Japan , and renewed violence in Ukraine . 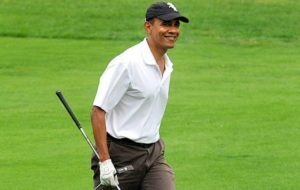 After making a brief statement about the Islamist terrorist group Islamic State’s brutal beheading of captured American journalist James “Jim” Foley, Obama left the press conference went back to golfing in Martha’s Vineyard in Massachusetts. The article quoted former press secretary of George W. Bush Dana Perino, “Perception is reality, and it takes a long, sustained effort to change perception.” It goes on to say, “Inevitably it happens with every president in the modern era” and listed examples from George H.W. Bush, George W. Bush and Bill Clinton administrations. So much for a balanced, neutral press.